The BlackBerry Z10 might be the prom queen of the BB10 launch, but the Q10 and its physical keyboard is what a lot of people are actually waiting for. "Will I still be able to have a BlackBerry like my BlackBerry after this?" Sure, just better. Let's get right into the biggest thing you're wondering about: The keyboard is slightly larger than the already-super-usable Bold 9900's. It's also flatter, compared to the 9900's slightly curved keyboard. The layout is unchanged, but the keys also have less of a gloss to them, which is a small detail but affects the tactile feel of the keyboard. That comes out to a typing experience that feels totally like a BlackBerry keyboard, while also feeling slightly less staid. This, somehow, feels like a modern phone, just with a physical keyboard. Then we get into the actual software. BlackBerry 10's fancy new gestures work just fine on the Q10's smaller screen, and some are actually easier to pull off. Swipe-from-bottom to display your notifications, slide over to see the Hub; that's more efficient here than on a bigger display The home screen with its active panels (they're live tiles, just less stylized) is a little more cramped than the Z10's—confirming that it's not just a pure crop of a fuller screen—but it's still mostly usable. The display is sharp enough that you won't have to worry about the clarity of the text, but it also doesn't quite pop like an iPhone or Lumia 920 does. How's the build? The Q10 has a softtouch back, and feels noticeably lighter than the Bold 9900, even if it isn't actually in practice. The Bold was all hard lines, metal and plastic. 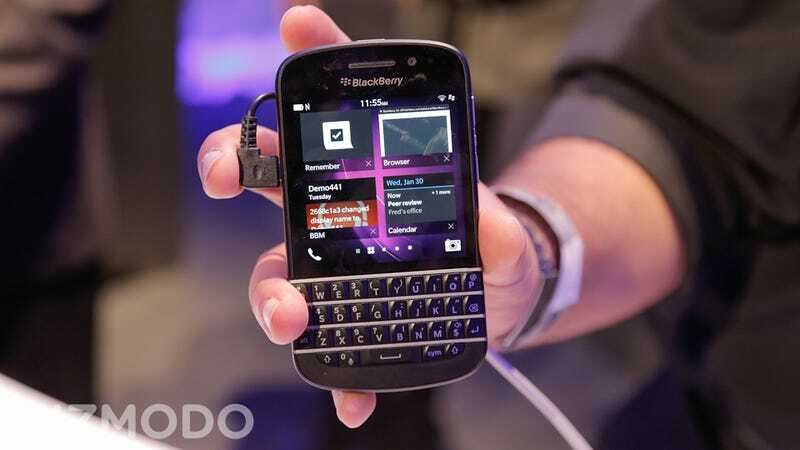 The Q10 has a gentler appearance, though it still seems like it would be durable. In some ways, the Q10 is surprisingly the more important device to come out of today's event. Everyone's got a touchscreen flagship these days, but it's been hard to find a competent phone with a physical keyboard. If that's the kind of thing you've been waiting for—and surely at least some of you have—you may have finally found your answer.